President Barack Obama and first lady Michelle Obama are visiting with the British royals tonight, but for once, all eyes are not on what the Duchess of Cambridge is wearing — because Prince George’s ensemble is way too adorable! The Obamas met up with Prince William and the former Kate Middleton for dinner at Kensington Palace in London this evening, and little George stayed up past his bedtime to say hello. But what he was wearing will make your ovaries explode for real. Look at that tiny little bathrobe! Look at it! The little prince also hopped on the rocking horse the Obamas gave him when he was born, looking like a dapper rider — pajamas, slippers, robe and all. “This evening the Duke and Duchess of Cambridge and Prince Harry hosted the President and First Lady of United States for dinner at Kensington Palace — before dinner Prince George had the opportunity to meet the President and First Lady,” The British Monarchy Facebook page posted. 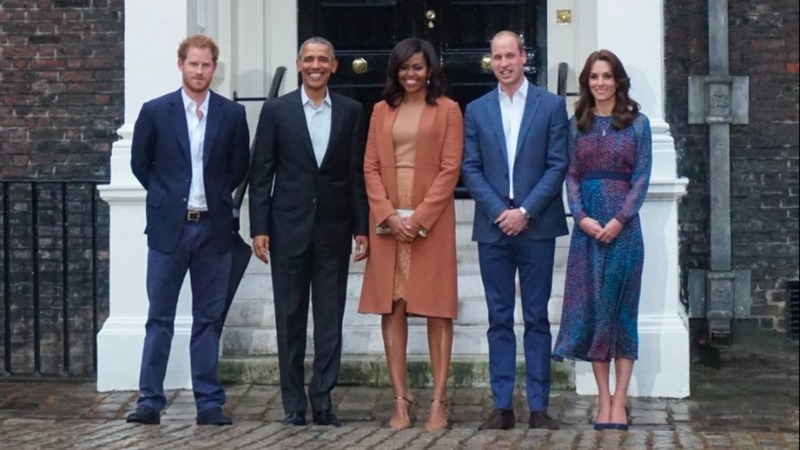 A royal aide added, “When the Duke heard that President Obama was lunching with his grandmother he extended an invitation to join them for dinner. He was delighted that he could find time in his schedule to join them.” Princess Charlotte was already sound asleep when the guests arrived, according to the aide. The dinner is the first official event Will and Kate have hosted at their newly refurbished Kensington Palace apartment. “She’s an astonishing person and a real jewel to the world, not just the United Kingdom,” Obama said.